Paperback Book Boost Your Career or Business - Harness the Power of Image , Civility and Personal Branding to Gain Competitive Advantage in the New Global, Relationship Economy Yasmin joins with other top Image Consultants from around the country to offer indispensable advice on boosting your business or career. The book is a one-stop source for valuable tips and strategies for harnessing the power of image and branding to make you gain visibility and stand out among your competition in the new global economy. A must have for your personal/professional development. In this easy to read chapter of the book Executive Image Power, Yasmin shares the meaning of civility and discusses its relationship to business and personal image and ethics. The eBook introduces Dr. P.M. Forni's principles of civility and twenty-five rules of considerate conduct. It also features Yasmin's image and model, a civility challenge quiz and other valuable resources to help you enhance your personal and professional development. Available as a CD or downloadable Mp3. Paperback Book The Power of Civility is packed with thought-provoking perspectives on the meaning of civility and practical solutions for incorporating civility best practices into your work and life. Yasmin joins top civility and etiquette professionals to go beyond the typical "please and thank you" conversations about civility. The book challenges you to think about personal standards, accountability and values. Got etiquette? Do you, your students, employees, colleagues or children have the dining etiquette savvy to project an image of self-confidence and competence? 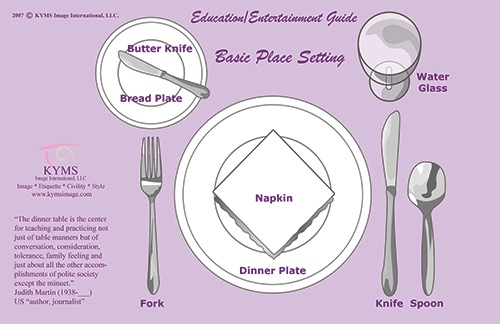 The KYMS Etiquette Placemat is the education/entertainment resource guide to help you. The two-piece, laminated set is a multi-cultural guide to the Dos and Don'ts of etiquette, place settings, tips on teaching manners to youth for parents and teachers, Name That Thing etiquette game and tip sheets. Can be purchased with an etiquette lesson or demonstration for parties or workshops. Please call for pricing. 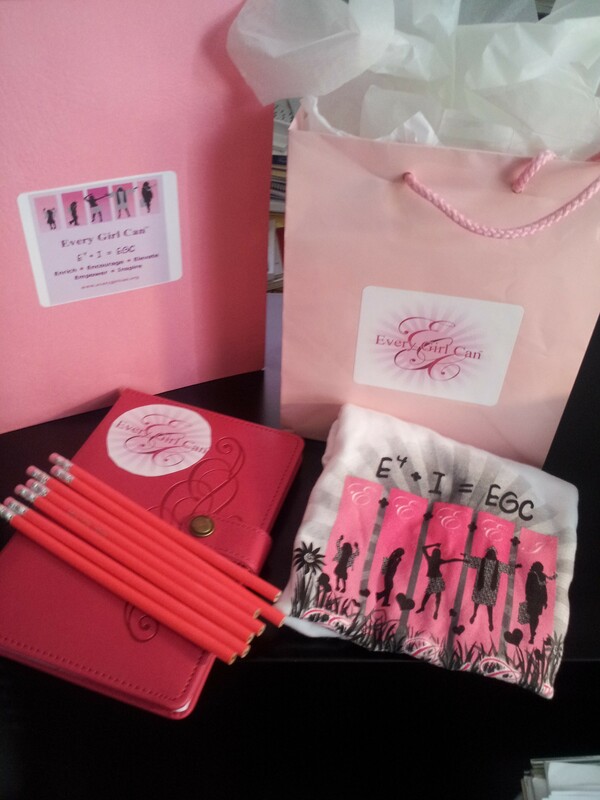 Inspire and empower a teen girl or young woman by sending this delightful themed gift package. Includes: a gift bag, Every Girl Can T-Shirt (S, M, L,XL), two-pocket folder, six pencils and a journal – all in pink Support the Every Girl Can healthy body image/life skills program with your purchase. Cost: $40.00 + tax FREE shipping within the USA and Canada. Please call or shipping prices to other locations. T-shirt is slightly shaped. Kick back and relax with a few girlfriends as you enjoy the lighter side of image with presenter Yasmin Anderson-Smith, image and personal branding consultant, coach and trainer. Choose from presentation topics on personal image, etiquette, fashion, wardrobe management, shopping, or personal style. A fun, hands-on treat for yourself or give as a gift. May also be donated as a fundrasier/auction item for the charity of your choice. Includes wine, cheese and crackers for six, a 60 minute presentation and give aways.